Ice Resurfacer wrap completed just in time for Christmas! Piros Signs was more than happy to help wrap this ice resurfacer for the Blues & Dobbs. [Read more…] about Ice Resurfacer wrap completed just in time for Christmas! 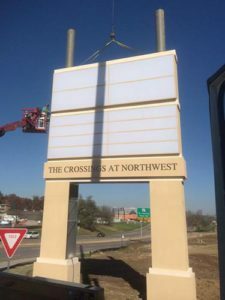 The Crossings at Northwest is officially on the map thanks to Piros Signs! Piros Signs is putting the finishing touches on The Crossings at Northwest pylon signs. This 50 foot beauty was designed, fabricated and painted right on schedule thanks to our talented crews. [Read more…] about The Crossings at Northwest is officially on the map thanks to Piros Signs! We here at Piros Signs are 110% St. Louis Cardinals baseball fans! 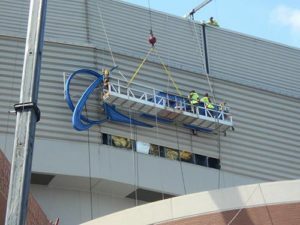 The Boeing sign at Edward Jones Dome gets a little help from Piros Signs. Further proof that no job is too big for Piros Signs. Our crew is right at home way up high as they replace neon in the Boeing channel letters at Edward Jones Dome in St. Louis, MO! 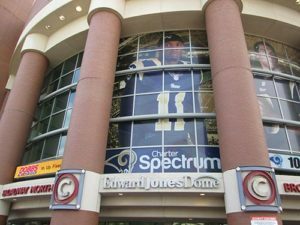 [Read more…] about The Boeing sign at Edward Jones Dome gets a little help from Piros Signs. 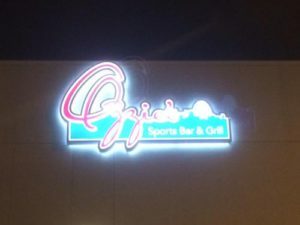 [Read more…] about Perforated Window Vinyl Graphics will get your business noticed!